THE Himachal Pradesh government's attitude towards implementing the Catchment Area Treatment (cat) plan has been described as sluggish by environmentalists. The state government has also been accused of not utilising the cat plan funds on field. Sources reveal that funds are being diverted and a major part is being stored in the treasury. Besides, Jai Prakash group's 300-mw baspa-ii in Kinnaur and Sutlej Jal Vidyut Nigam (sjvn) Ltd's 1,500-mw Nathpa Jhakri Power Project in Shimla have been accused of not releasing full money for the cat plan. 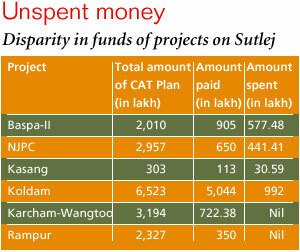 A number of other hydro-electric projects are accused of the same (see table Unspent money).The forest department, supposed to implement the cat plan, has also been charged with not paying enough attention to the matter. 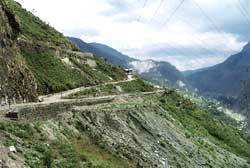 According to sources, afforestation in the catchment areas of various hydel projects is underway but the pace of this work is slow due to shortage of staff. Expressing concern over the issue, environmentalist and researcher R R Sharma says, "The unscientific approach adopted by the state government and private authorities in the construction work of the dam is causing erosion in the Kinnaur mountains. Besides, the casual approach of the state government towards implementation of cat plan in the Sutlej Catchment is adding to its woes. The state government should understand the sensitivity of the environment degradation aspect before it goes beyond repair." Government officials, however, are on the defensive. State forest minister, Ram Lal Thakur, says, "The seriousnesas of the state government regarding environment protection can't be questioned. Work is being done in a phased manner and with utmost sincerity." Power minister Vidya Stokes, says, "The high silt level is because of haphazard dumping along the river. Forty-eight rivulets of the Sutlej also bring silt and if the cat plan is not implemented, one can imagine the extent of deposition."